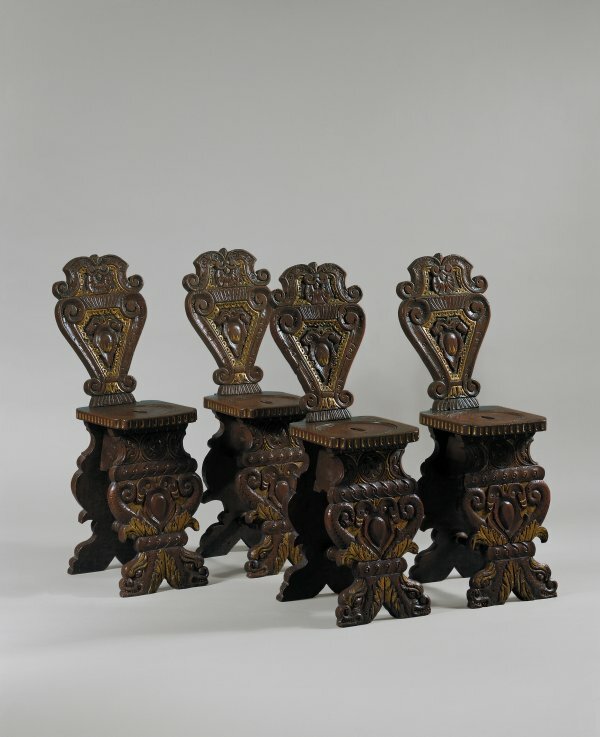 A set of four sgabelli or stools with back, made with carved walnut wood, with shaped outline and openwork and with medium and low relief and partly gilded with lumegiature, or touches of gold, to highlight certain features of the decoration. The seat itself is constituted by a truncated pyramid structure formed by two boards -front and back- acting as supports, and by two staves, which join the previous panels, with a mortise and tenon; in the same way, acting as a frame, and perpendicular to the front panel, there is a turned crossbar in the shape of a baluster, also fixed with a mortise and tenon joint. The seat is placed end-to-end and fixed with iron nails. It is rectangular, with cut corners, it has a kind of cut-out tongue in the rear end, where the back panel is fixed, and the top side presents a slight lowered circular part, with moulding, made with a lathe, and a cut-out handhold in the middle. The slanting back is formed by a single board with a long tenon, cut in the bottom edge, which goes through the back of the seat and is fixed with two wooden pins or pegs under it. These pieces of furniture, the predecessors of English hall chairs, were designed to be placed against a wall and therefore to be seen from the front. All the boards forming the chair have a shaped outline and the front side of the back of the chair and of the front support, as well as the side and front edges of the seat, are carved. The back of the chair is made up of two decorative registers; the top one, acting as a crown, has two mixtilinear "S" curves bound together on a palmette, and the bottom one is composed of two other "S" curves of similar shape but with a more sinuous profile and larger, placed on the sides of a cartouche, inside which is an oval mirror with the outline of an unidentified coat-of-arms above it. The edges of the seat board present a vertical gadrooning. The front support is decorated in three registers, separated by guilloche friezes that help to break the general sense of verticality, typical of this kind of seat. The top register is decorated with a central rosette inside a circular moulding and two half-rosettes, like two half-moons, at the sides; the two bottom registers present a common composition, interrupted by the previously mentioned guilloche frieze showing acanthus leaves and the bodies of two dolphins with mouths touching the ground and diverging tails, creating a central space for another cartouche with an oval mirror in the middle. The rear support board has a profile shaped like the front panel, but lacks the carved decoration. Taking into consideration these four sgabelli, it would seem that they have been either radically restored or made up of various original fragments put together with new parts. This type of manipulation of antique pieces was frequent -as far as Italian renaissance furniture is concerned- at the end of the 19th and first half of the 20th century, partly due to the fact that the collectors of that time only appreciated pieces of exceptional quality and impeccably preserved, occasionally without a real concern for the authenticity of the pieces. The marks left by the plane and the manual saw used for carving the various components making up this set of chairs are generally speaking too evident and, in addition, different in each chair: some show cuts which are too precise and neat for them to be antique, while other are too rough and thick, sometimes excessively, showing the work of different hands, which may suggest they were made by different artisans or workshops, and in different periods. The rear sides of the backs do not present a homogeneous carving. Certain important parts of these chairs present decorations carved by different hands and not worn with the passing of time, the marks left by the gouges when carving the wood are too clear, a detail which suggest substantial substitutions in a later period to that of their manufacture. The patina of the walnut wood, with some differences, lacks the intensity it might have had if they were 16th-century pieces, whose finishing would have consisted of a coat of beeswax. Only one of these sgabelli presents a better general aspect, with more logical wear, with more convincing tool marks and a better patina. The sgabelli or Italian renaissance stools originated in Tuscany during the 15th century. The oldest preserved have three straddling legs and a narrow slanting back which goes through the small seat board and is fixed under it. Two specimens with this structure are known, with the coat of arms of the Strozzi family, in a circular moulding at the top of the back panel; one is kept at the Museo Horne in Florence, and the other at the Metropolitan Museum of New York. During the 16th century this genre became greatly diffused, documented in practically every region of Italy, presenting as the only structural transformation worth mentioning, the substitution of its original three-leg support with two panels, front and back, placed with a slight inclination and diverging from each other, thus increasing the stability of the chair. Throughout the century this type of stool, with or without a back, maintained the status of showpiece furniture -the reason why it frequently shows coats-of-arms- and luxury item, showing in the best specimens a carved decoration equivalent in quality and complexity to that of the most valued chests of the same period. Due to the idiosyncrasy of Renaissance Italy -divided into many different territories often with very different characters- the specialised bibliography has attempted to classify geographically these and other pieces of furniture, often on the basis only of the place where they were found -without taking into account the continuous decontextualisation the piece may have experienced throughout the centuries- and of a series of stylistic criteria, very often pre-established according to assumptions difficult or impossible to verify, and occasionally elaborated on the basis of the analysis of pieces the authenticity or provenance of which have not been rigorously asserted. The most recent published studies try to solve the serious problem concerning the history of Italian Renaissance furniture, dealing primarily with the "reliable" pieces in terms of their period and provenance; this might be the reason why it seems that in the more recent and rigorous books there are fewer reproductions of Renaissance furniture than in those of thirty or more years ago. Logically, this situation of confusion affects the study of these four sgabelli from the Thyssen-Bornemisza Collection; in the first place, due to the lack of guarantee regarding its authenticity provided by its visual analysis, and secondly because almost as many different geographical areas can be suggested for their provenance as are the Italian authors consulted. The book Italian Furniture and Interiors, published in 1918, shows two sgabelli which are related to the ones we are dealing with, without specifying their geographical provenance; one of them, kept at Villa Pia in Florence, has the same back, while the other, belonging to the Palazzo Davanzati collection, is practically identical. In 1927, in the catalogue of the sale of Professor Elia Volpi's Italian art collection, four sgabelli identical to those of the Thyssen-Bornemisza Collection were classified as coming from Umbria and, in addition, as proceeding from the Duke's palace in Urbino. These sgabelli are so similar to those in the Thyssen-Bornemisza Collection that one would almost think they were the same. The first two lots were sold for $150 each, the third for $170, as was the fourth, in spite of the fact it did not have a back. More recently, in 1973, Cantelli maintained the same classification for this type of chair with "S" curves and dolphins, and showed a reproduction of a very similar sgabello. Years later, in his book of 1980 on the history of Venetian furniture, Alberici dealt again with the same type, classifying it as Venetian, without mentioning the former classifications. On the other hand, there are also many authors who have classified the sgabelli of this model as Florentine or Tuscan. We can quote, for instance, those who have previously dealt with the cataloguing of these objects in the Thyssen-Bornemisza Collection; they were thus classified by Feulner in 1951, Heinemann in 1958, Borghero in 1986 and De Watteville in 1989. However, the existing problem may be well illustrated by the fact that there is no graphic reproduction of this model in the most recent study on Tuscan furniture, published in 1993 by Massinelli (Il Mobile Toscano, Milan, 1993). Another question on which the different authors consulted do not seem to agree is their dating. Some suggest a rather early date, situating them at the beginning of the 16th century, without taking into account the mannerist aspect of their decoration, while others date them, perhaps more reasonably, around the middle or even the second half of that century. If the images are being used for purposes other than those described above in paragraph 3, prior written permission from the Fundación Colección Thyssen-Bornemisza is required. When an image owned by the Fundación Colección Thyssen-Bornemisza is reproduced, all reproductions or the list of photographic credits must include the following: the name of the artist, title, date, © Carmen Thyssen-Bornemisza Collection on deposit at Museo Thyssen-Bornemisza, Madrid.